You’re planning your wedding day and honeymoon in Napa Valley. Of course, you want a romantic getaway that will meet your specifications. It should have exceptionally beautiful scenery, great lodging and amenities, places for fun and recreation, as well as a complete retreat from the hustle and bustle of the city. Considering those factors, Napa Valley is the perfect choice? If both newlyweds love fine wine as well, then that’s a big bonus! The famous wine growing region offers beautiful sights, lots of activities, luxurious amenities, and accommodations that honeymooners can enjoy! There are many hotels and other lodging in Napa that are designed with romance in mind. So it may not be hard for you to find hotels with king-sized beds, in-room menus, a hot tub, a pool or a Jacuzzi, and a balcony, preferably one that will let you view the beautifully-arranged Napa vineyards. If you and your new spouse love wines, then it really matters that the hotel that you will be staying in should be conveniently near vineyards and wineries. Visiting and wine tasting at the Domaine Chandon in particular will be one of the highlights of your wine journey. If you and your new spouse are certified foodies, Napa Valley is still a great destination. You can drop by several farmers’ markets such as St. Helena’s and the Oxbow Public Market, which you can find the best of food and selection of wines. There are a hundred restaurants featuring diverse menus, so narrowing your restaurant list down to the top ten to visit may not be an easy task. If you want to have a more stylish romantic dinner date, consider the Napa Valley Wine Train. Go aboard one of the beautifully restored vintage coaches and you’ll be greeted by the luxurious early 19th-century interior decoration, couches, dinner chairs and tables. Wine and dine while the train crosses through the heart of Napa Valley. Be on the lookout for the train’s special events and make a reservation in advance. Take a dip in the waters of Lake Berryesa, which are just east of Napa Valley. Soak up the sun at the lakeside. Consider jet skis or other extreme water sports for action-filled honeymoon activity. But if you want a much gentler pastime by the water, you can rent a boat or canoe or rent a paddle for paddle boarding. A sunrise hot air balloon ride will seal the deal if you would like to experience romance and adventure! An estimated 50,000 people, including newlyweds, make their reservations to enjoy hot air balloon flights every year. Balloons Above the Valley (BATV) will make your special honeymoon extra-special. Well, come on…you’re up in the heavens, floating above the beautiful Napa landscape below mostly made up of neat rows of grapevines, bright green hills, and valleys. The morning is calm and peaceful, and it’s like you have the whole paradise to yourselves. What could be more romantic than that? 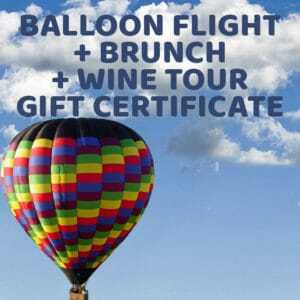 Many of BATV’s sunrise hot air balloon and wine tour packages are catered for two persons: the Sunrise Balloon Flight/Champagne Brunch/Wine Tour, the San Francisco Balloon and Wine Tour Package, and the San Francisco Balloon and Wine Tour Package. These packages allow you to do wine tours, have the benefit of comfortable luxurious transportation, pre-flight breakfast, post-flight brunch, and so much more! If you want to have a more “you and me” time between you and your new spouse, consider booking one of our Exclusive Flights. You can have the hot air balloon ride to yourselves (except for the pilot, of course!) and a private table at our post-flight champagne brunch. This will make your hot air balloon journey much more special and intimate. Hot air balloon flights, especially from Balloons Above the Valley, will definitely make your honeymoon in Napa Valley something to really remember!